We pay attention to our interests. That's what makes us unique. One, or should I say two of the things that I never saw while I was at the Fair was the HMS Bounty and the Santa Maria. Rockets were my jam, not ships of the ocean. That's why it never occurred to me to closely look at these two exhibits. Only recently, while doing a bit of research did I discover something. The Santa Maria was in the Lake Amusement Area (or Lake Area as it was known in the 1965 Guidebook--I guess the amusements were gone). The Santa Maria had a clearly labeled entrance to board the ship. For some reason, I always assumed the HMS Bounty was in the same area (water, maybe?). Well that was until I went looking for it on the Time-Life map. Guess what? It's not there. So consulting the Guidebook (just 1964), I find it isn't even on the Fairgrounds. The HMS Bounty was docked in the Flushing Bay Area marina. Looking at the Time-Life Maps (1964-1965, 1964-1965a, and 1965), the World's Fair Marina isn't even on the map. There is an arrow pointing to the direction of the World's Fair Marina on both maps. However, the arrow points to two different directions on different maps. On one map the arrow points northwest and on the other northeast. Interesting. 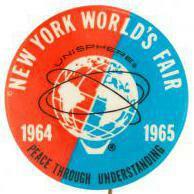 It is listed in the 1964 Guidebook and numbered (along with the marina and Shea Stadium. Heck, downtown New York is in the Guidebook. I don't consider these part of the Fair). In 1965, just the marina and stadium are listed and numbered. Shea Stadium part of the Fair? Well, maybe just for parking. Imagine how someone who did want to see the Bounty would have to figure out the logistics of getting there, an arrows on a map pointing in two different directions, and the area not even shown on the map! No wonder it was only there for a year. HMS Bounty, to me you're like Pluto. One was once a planet, and the other I don't consider part of the Fair. Brought to New York as an exhibit at Fair time, but not part of it. And if it were to be part of the Fair, why not dock it in the Lake Amusement Area? There's plenty of room. Put it where the Mississippi Showboat was/wasn't. As they say, you learn something new every day (and I thought I knew just about all of the Fair). Well, it was listed in a number of press releases put out by the Fair Corp., besides being in the Guide Book, so to me it was there. I imagine it was too big to get over to the Lake Amusement Area - would have needed the masts removed, etc. If I could get a crack at some of early planning documents, I'd like to see whose idea it was to try and bring the Bounty there and why they parked it where they did. Add to the fact that it was only there for one year and not both years of the Fair further diminishes it. Also, I wonder how regular Fairgoers got transportation to the marina to see the Bounty. I understand you could get a bus from Gate 2 to the marina. Was there a charge for this bus, or was it free? And what was the ticket handling process for admission to the Bounty? Did guests have to use a regular ticket and get their hand stamped or get a receipt to get back into the regular Fairgrounds? Some of Pavilions on the Fairgrounds charged an admission fee in addition to the "general admission" fee of the Fair. The Bounty charged 90 cents (children 50 cents). Was that 90 cents if you had a Fair ticket or 90 cents in addition to a Fair ticket? And if you didn't have to purchase a "Fair" ticket for admission, then it can't be called part of the Fair, but a separate admission fee for a separate exhibit. I still don't consider it part of the Fair "proper". BOAT: Bring out another thousand.